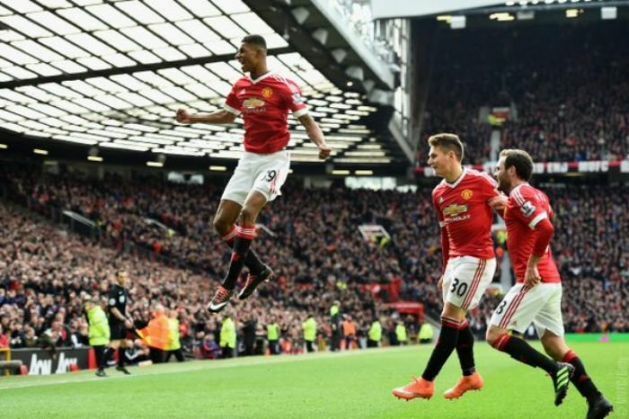 Manchester United manager Louis van Gaal was all praise for young forward Marcus Rashford, after the academy star's brace led the Red Devils to a crucial 3-2 win over fierce rivals Arsenal in the Premier League. "I could imagine the first game (against Midtjylland); he did that because he is a striker coming in to score goals and the first match is always good. The second match he has to do what the manager is willing him to do and he did it fantastically. His performance was better than the first match," the Dutchman told reporters following the game. United, who missed a number of first-team players due to injuries, had taken a 2-0 lead early in the first half courtesy of two goals from Rashford before Danny Welbeck pulled one back for Arsenal before the end of the first half. In the second half, Ander Herrera restored United's two-goals lead, minutes before Mesut Ozil scored Arsenal's second goal. The home side, however, held on to pull off a 3-2 victory. "This is my first game in the Premier League so obviously it's been amazing and to score two is a bonus so hopefully I can carry it on and do it again next game. "It was a shock playing midweek because [Anthony] Martial was supposed to be starting and coming in kind of benefited me because I wasn't thinking about it, thinking about the game too much so it's just been good," Rashford said after his match-winning performance.